This recording is an unalloyed delight. If a city in the Midwestern United States might seem an unlikely place to find a 17-member ensemble that can play centuries-old music with such style and warmth, keep in mind that one of the world’s best music schools is nearby. Let’s not overlook the presence of Barthold Kuijken who has been a vital presence in the baroque music scene for decades. The very title of his book, The Notation is not the Music, says a lot. 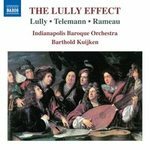 The title of the disk, “The Lully Effect”, indicates the influence Jean-Baptiste Lully had on subsequent composers. The two excerpts from Armide (dated 1686) demonstrate the dominance of wind instruments. Subsequent development brought forward a greater use of strings. The prolific Telemann’s Ouverture (dated 1716) is actually a suite, and an unusual one (the suite form was in the process of assuming the form we know so well by Bach and others.) The second of its five movements is not a dance but a brief bit of picture music, “Les Cyclopes”, with lurching passages representing the one-eyed giant. Then there is “Galimatias en rondeau”, a comical hodgepodge. The main work on the disk (over 35 minutes long, with 15 sections) is Rameau’s suite from his opera Dardanus (composed 1739/1744). The indicator Très vif appears frequently, but there is a wonderful variety within this marvelously compelling work.